You don't have to go out a limb for affordable tree removal and other services that work. Elevate the safety, appeal, and functionality of your commercial or residential property with professional tree services from our Sussex, New Jersey, company. McCullough Tree Experts is a fully licensed and insured company that has been providing total tree care for homeowners and business owners for more than 40 years. As a family-owned-and-operated business we know how to treat you and cater to your arboreal needs. Contact us now for premier tree services backed by our commitment to getting the job done right the first time. See our gallery of tree services, and learn more about us and what we can do for you and your property. We started as a 1-man operation, but our precision work, friendly service, and competitive rates have allowed us to grow into the premier provider of tree services we are today. 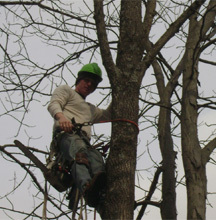 Our current crew of more than 10 has 35 years of combined experience to back their year-round tree services. Call us today at (855) 638-8709 for a free estimate on your tree services.